Look in any design trends magazine this year and you will likely find a featured room that includes a Fiddle Leaf Fig tree. It has been the favourite of designers for many years now and is one of our most requested tropical office plants. This plant has impact! It has huge and unique fiddle-shaped shiny leaves that feel almost like paper. The tree is available in many styles including a column shape with multiple stems covered in leaves top to bottom, a tree form as pictured, and a tree form with a braided trunk. A newer variety is the “Little Fiddle’ , with more abundant, small compact leaves. 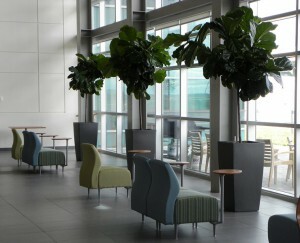 We often use the Fiddle Leaf Fig as a stand alone feature tree, in a large sleek container. See the attached images. Check out our instagram too. https://www.instagram.com/mooreparkplantscapes.ca/ We often post images of this tree from our installations. In addition to its good looks, the Fiddle Leaf Fig tree is typically a trouble-free plant for the office or home. It is resistant to most common pests, and although it prefers bright light, it will tolerate a north or east window. Just remember that in lower light, it will not require nearly as much water. Check the soil each time before you water the tree. The soil should have only a bit of moisture 2 inches below the surface. Only then should it be watered. It is a member of the Ficus family, which is native to swampy areas, so it does not like to dry out too much. It does very well when set up in a pot with sub-irrigation (watered from the bottom). It tends to grow quickly, and will branch out into unique forms. Prune it regularly to keep it full and polish the leaves with a soft cloth periodically. Fertilize once per month from early spring until late fall.